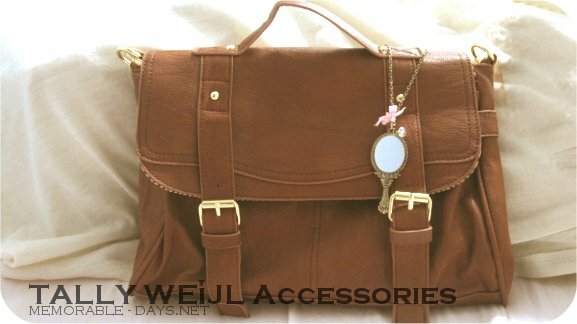 TALLY WEiJL Accessories ♥ | Memorable Days : Beauty Blog - Korean Beauty, European, American Product Reviews. I got sponsored by the famous clothing store TALLY WEiJL!! A few weeks ago I received an email from TALLY WEiJL and they were so kind to offer me a few items of their spring 2011 collection *jumps around* \^o^/! I was so thrilled about it and I couldn't even believe it at first. I could even go to the nearest TALLY WEiJL store to choose a few products that I wanted. How A-W-E-S-O-M-E is that ^_____^????? Can you still remember my previous post about their spring 2011 collection? : http://www.memorable-days.net/2011/01/tally-weijl-spring-collection-2011.html. YER YER YER! 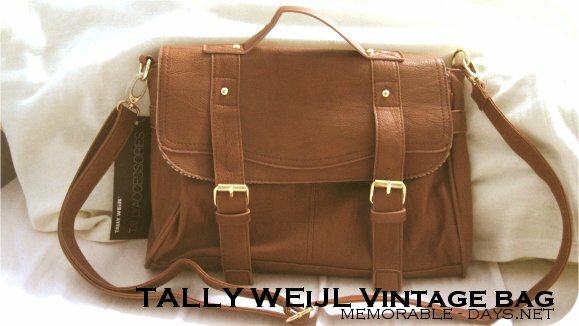 I chose the brown vintage bag! This bag is worth €25.95 ~ Well, what do you think about it :) ? A few close ups of the bag: Once you open the bag you will see a stripe pattern - blue, dark brown and light brown stripes. I also chose a vintage mirror necklace which has a pink ribbon on it. Price: €5.95. I really like this spring collection and I'm happy with the products cause they are of good quality and it's easy to match with my outfits ^__^. I will have a blogpost about my Outfit Of The Day with this vintage bag soon~ Visit the TALLY WEiJL website to check out their spring 2011 collection and "LIKE" their facebook page to get the latest news about their collection. Even though this store is not located in your country you can still join their giveaways on their facebook page! They usually ship the prizes worldwide so "LIKE" their fb page if you haven't ♥. These two products are sponsored by the company – read the disclaimer page for more information. Eeee, I really want to get a bag like this hmmm; I wish I could fly over there and buy it T-T"~ /sad/ hmmmmm <3 <3 <3 and the necklace looks heaps goooood ! 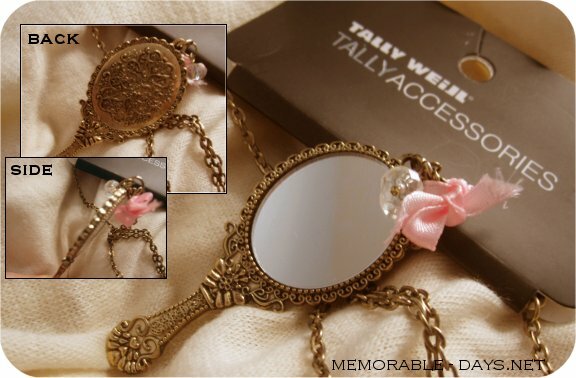 I hadn't heart of Tally Weijl before, but I just checked out their website and they have such cute things! I wished they'd open a store here in the UK. Good choice on the bag and the necklace. The bag is such a lovely vintage style. Such great presents, congratulations! So coooool! =*___*= The necklace is cutie-cute and the bag looks trendy! hyaaa thats a gorgeous bag! Thank youuuu all for the sweet comments ^^ ! Ohwooohhh dat zijn echt fantastische items. KWIJL TOT DE TIENDE MACHT!